Russia is said to be tightening its grip on news sources in Crimea during a power blackout on the peninsula, according to reports, as the Kremlin continues to wage information warfare in Eastern Europe and abroad. 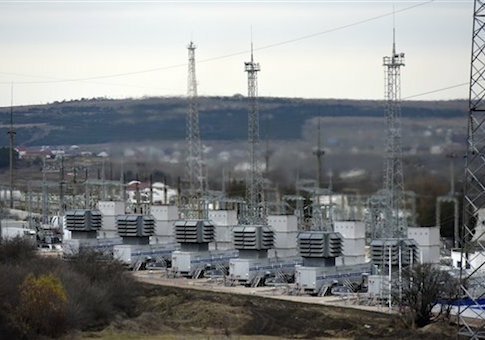 After pro-Ukrainian militants detonated explosives on electricity lines that feed into Crimea, the peninsula’s 2 million residents have faced power shortages for long periods in recent days. Ukrainian nationalists and Tatar activists, a Muslim minority group in Crimea, targeted the power lines in retaliation for Russia’s annexation of the peninsula last March, which Western officials said was illegal and involved Russian troops. Reuters reported that Crimeans, including a large percentage of Russian speakers and consumers of Russian TV networks, have blamed Ukraine rather than Moscow for the crisis. Earlier this year, Russia cut off the last independent Tatar TV station and expanded the reach of its own outlets. Those networks feature a heavy dose of anti-Ukrainian and anti-Western propaganda. There are also reports that Moscow is using mobile TV units on vans to broadcast Russian news to Crimeans without power. Russia has employed a variety of tactics to spread propaganda that portrays Western countries as ideologically extreme and aggressive toward Moscow, including using social media to promote hoax stories and linking Ukrainian forces to fascist movements and terrorist groups. The recent downing of a Russian warplane by Turkish fighter jets provides another example of how Russian propaganda manipulates events to sow distrust and confusion among its audiences. While President Vladimir Putin officially criticized Turkey for the incident and called it a "stab in the back delivered by the accomplices of terrorists," Russian media and state agencies broadcast several different theories about the culprit behind the jet downing. Some reported that the CIA was "controlling" the Turkish F-16s, others said that President Obama approved the actions by the Turkish air force, and still others attributed blame to terrorists shooting anti-aircraft missiles supplied by Ukraine. "Follow the Russian media over any time period and you soon begin to see patterns in the reporting of news," wrote columnist Anne Applebaum last week in the Washington Post. "Nothing ever just ‘happens.’"
"Every event is always part of a larger story, usually a conspiracy theory," she continued. "Russia, or rather a plot to destroy or undermine Russia, always lies at the center. Elements of reality are included in the story, but distorted with virtual reality in order to suit the story line." Conditions for Crimean residents have steadily deteriorated since Moscow assumed control of the peninsula and its news sources, anti-Russian activists say. In addition to the power shortages at schools, homes, and businesses, Russian authorities have denied free speech and assembly rights to dissidents and raided the homes of Tatars, who were previously deported by Stalin. Christoph Bergner, a member of Germany's parliament, said in October that, "the human rights situation in Crimea today is deplorable." "It is telling that, on the 70th anniversary of the deportation of Crimean Tatars, Crimea's chief prosecutor placed a ban on assembly in Crimea," he said.